How eagerly we scanned the heroic propor­tions of this worthy official! and how breathlessly we ques­tioned him! receiving but curt, monosylla­bic replies, for our new acquaintance evi­dently thought we were perpe­trating a joke at his expense. Total annihila­tion might have been our fate, had not the bookseller has­tened to explain that the too-curious querists represented a well-known Eng­lish magazine, whereupon we were courteously invited to the club on the following evening, when important discussions relating to the rules of the society were to take place. We kept the appointment, and found our­selves in a narrow, low room, where we hastened to hide our meagre frames in an obscure corner. 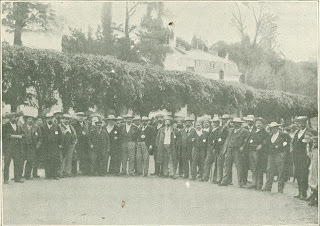 Several of the members had already arrived, among whom were the honorary president, M. Beebe, who scales close upon 27st; his frank, clean-shaven face was inspiring, but his handshakes were operations to be remembered by the average mortal. As his portrait shows, he is cast in an heroic mold - no deformity, nothing repulsive; simply a man good-natured and healthy, with a physique that distinguishes him above his fellows. We wondered how he could possibly "pre­side" over any­thing without killing it. 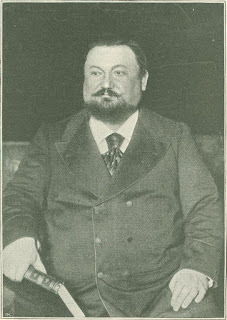 Next to him sat the actual president, M. Berthoud - like his colleague, a wine-merchant; on the left he was supported by the treasurer, who, on a very exten­sive scale, resem­bled a Piccadilly masher; his glossy top-hat was a revelation in head-gear, and it might have been used for the storage of goods. With interest, not unmingled with anxiety, we watched the gradual assembling of the members and their safe seating. A bell, rung by the chairman, announces that the meeting is about to begin; the hum of voices ceases, and the chairs creak ominously, as each member endeavors to fix his attention upon the proceedings. No wonder the pro­ceedings nearly broke down once or twice. 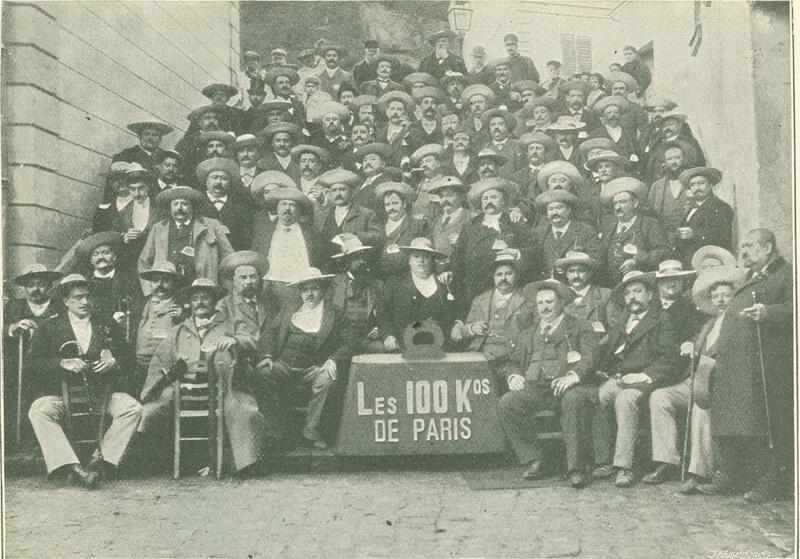 Our wandering thoughts are recalled when the secretary stands up to read the articles of this strange society, Les Cents Kilos de Paris, founded in 1896, and which, we learn, has three special objects: 1. The establishment of amicable relationship between the members. 2. To organize, on certain occasions, excur­sions on steam-rollers, and banquets, etc. (Here the secretary is interrupted by one of the burliest members, who, with an apprecia­tive laugh, shouts out, "Certainly we must amuse ourselves in the best possible way." The secretary, with a withering look at the offender, proceeds.) 3. To create a center of support (surely a matter for an engineer) and of brotherhood to members of similar societies visiting Paris. In case of the death of one of the members, the secretary can summon each member to assist at the funeral, and a wreath is to be provided at the expense of the club, bearing the inscription, "Les Cents Kilos de Paris." Here our burly friend again is heard: "Is everybody to attend? What are to be the dimensions of the wreath?" and "What the fine," shouts another, "for non-attend­ance?" This cheerful subject starts an ani­mated discussion, which lasts for half an hour, the general opinion evidently being that no fines are necessary, as theirs was a gathering of bonsvivants, and not of shareholders. "Divide, divide!" is soon heard, and a proposition is made that the voting shall be done as in the Chamber, viz., by each member rising from 'his seat; this, how­ever, is at once vetoed, as it would be both difficult and dangerous. At last the matter is satisfactorily settled, and the next business on the agenda is dealt with. The first and most important qualification of a would-be member is weight, which must be not less than 1oo kilos. Here a kindly amendment was suggested: "That if any member lost weight from any cause, he should not be expelled at once, but a little time accorded him to regain his proper proportions." He might even be fattened up on "Thorley" for a reasonable period. The only other qualifications necessary to insure entrance to this club are: to be a son of France, and a payment of a modest entrance fee of 2fr., with an annual subscription of 24fr., payable monthly. One rule is rigidly enforced, and that is, the exclusion of all discussions on religious and political subjects. In short, no "heavy" subjects were admitted save the members themselves. This wise order not only preserves harmony, but also the physical well-being of the members, excitement of any kind not being conducive to obesity. "By what means are the members to recognize each other?" was one important question; the answer seemed obvious enough, but the suggestions were many, and provoked considerable hilarity. It was, how­ever, finally decided that every member should wear a large panama hat, carry an exceptionally heavy stick in the hand, and have a badge in the button-hole with "100 Kilos" inscribed on it in gold letters, the same inscription also to decorate the front of the hat. While these discussions were pending, and occasionally reaching stages that were uninteresting to mere onlookers, M. Feche, the founder of the society, explained to us how it came into existence. "All round us," he said, "there were plenty of athletic and sporting clubs being formed, but, as you may imagine, we were not con­sidered eligible as members; indeed, we were looked upon as pariahs. A 100 Kilos Club was then started, not in Paris, but at St. Denis, and it was not until after many dis­cussions between the members of Paris proper and their suburban colleagues, that I succeeded in calling into life this Paris organization, and here we are," he concluded, with a proud wave of the hand, as he glanced round the crowded room and at the beaming faces and portly forms of the members. We passed a very pleasant evening, seeing more than being seen, for we were but Liliputians in the country of the Brobdingnags. The cordial adieux of our entertainers will not soon be forgotten; our hands still ache when we recall the parting. Between ourselves, if we started a fat men's club in this country we could knock the French institution into fits. We've got the means and we've got the men. And we'd make it pay; we can't help it. Eventually it might be turned into a company, when the leaner kine might be weeded out on the well-known biological principle of the "survival of the fattest." We had yet one wish ungratified - that was, an opportunity of studying the fat men in their home circles; to find out if their wives and families were molded on the same liberal lines, and also if their furniture was insured. Our kind hon. president possibly divined our wishes, and cordially invited us to break­fast at his establishment, in the Rue St. Maur, not far from La Roquette, on the following morning, at 12.30. Needless to say, we went, and found our weighty host moving nimbly among his customers, and liberally joining them in their libations. Too liberally, we thought, as we noticed, from time to time, several angry glances shot at him by the lady behind the counter, which convinced us that here was the better half of our president, and, although she was thin, and not possessed of a quarter ­of her husband's weight, it did not require extra ­much perception to come to the conclusion ordinary bulk of our friend, we thought. that she was indisputably the Monsieur le President of the home. Such is woman's power! And how impossible it is for men, even those who are modern Samsons, to oppose it. Our host was just then called away by his son, a little mite of a fellow; he also ruled and turned his huge father round his tiny fingers. Dejeuner was announced, and we sat down to a multitude of good things, although it was the usual French meal, nothing substantial enough to account for the extraordinary bulk of our friend, we thought. Nor did his appetite for food seem particularly sharp, but the same could not be said about the liquid. Bottle after bottle of Piccolo and Bordeaux vanished with astonishing rapidity; but we will not betray hospitality by stating how many. The conversation naturally centered round the 100 Kilos Club and its members, and we gathered that the majority of them were wine-merchants or representatives, in some way, of the wine and spirit trade, although there were a few architects among them, who helped to shore up the club-room, and a repre­sentative of Art in the shape of a sculptor. 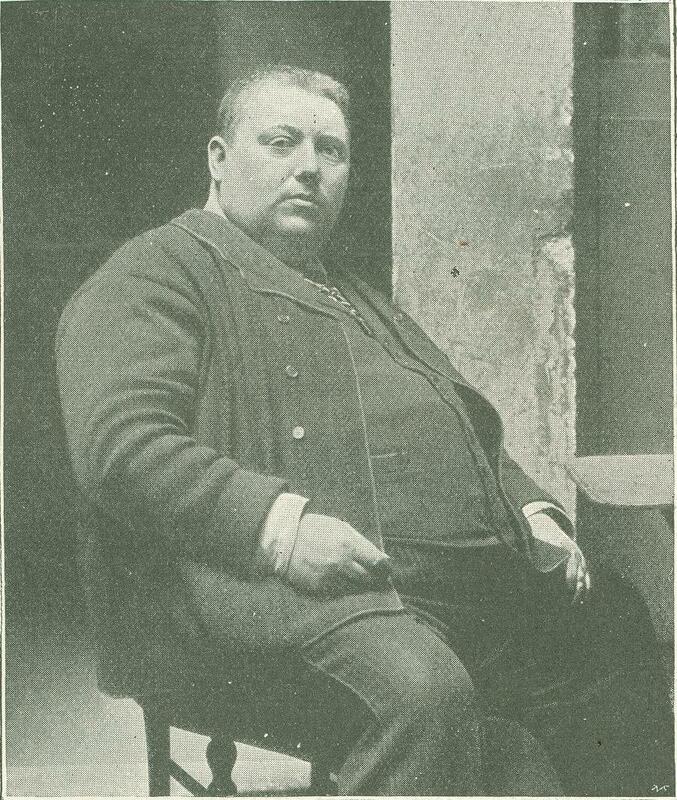 Asked about the principal events of the club history since its foundation, M. Fiche said : "We mourn the death of one eminent member, M. Finck, a brewer; and we also feel deeply for another member, M. Artigue, who, to his shame be it said, has managed to lose 80 kilos in weight. We were very proud of him." Now he only weighs 154 kilos, but is still one of the heaviest members of the club. "How many excursions have we had? Only one, up to now. We went to St. Cloud, and had a glorious time; we had races - I will give you a photograph. I assure you that after the second race the course was like a ploughed field. However, we came out in grand form, and were so cheered by the spectators that we felt that the military regulation, which precludes us from serving our fatherland, is a gross injustice." 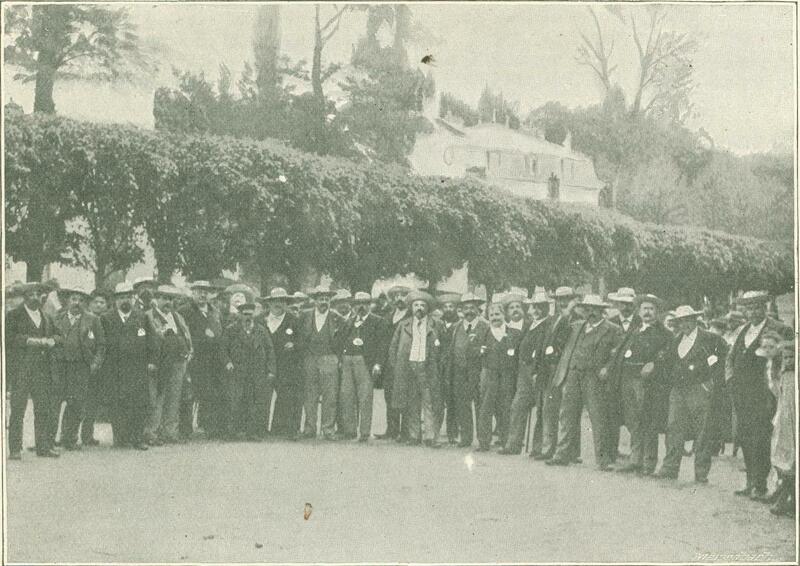 Great men we found these novel clubbites - away from home and from petticoat government - as we had several opportunities of judging. One special instance was convincing. We were anxious to present our readers with illustrations of the fat men at home. We suggested this to several of the members, but none seemed particularly to crave for the distinction; they interchanged sheepish looks, and hum'd and ha'd in a most perplexing way. At last one, bolder than the rest, agreed, but in making the appointment, insisted upon it being very early, "before madame is up," he added, in a whisper, We took in the situation at a glance, and duly presented ourselves at the hour named; but, unfortunately, when every­thing was arranged and our sitter posed in the graceful attitude in which the Great Napoleon was usually depicted, a vision in a dressing-gown burst upon us, and in a few minutes, but without undue haste, we were in the street, and, somehow, we felt no more interest in photographing fat men in the privacy of their homes. We realized that there are places where journalists and photographers - like angels - fear to tread. Originally published in the Stand Magazine in 1898.